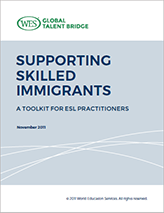 Supporting Skilled Immigrants has been developed for ESL practitioners who teach foreign-educated and skilled immigrants. It will also serve as a useful guide for anyone who advises or works with skilled immigrants. Fill out the form below to access the toolkit.